With BookingEntertainment.com, booking big name entertainment for events in Japan is easy and accessible to anyone. 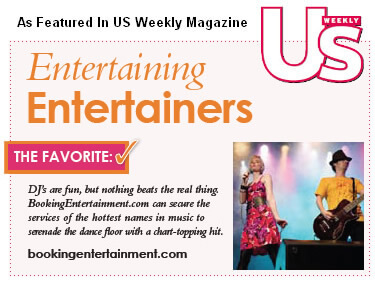 For almost 20 years, BookingEntertainment.com has been providing full service turnkey concerts for clients looking to book headline entertainment for their events in Japan. BookingEntertainment.com provides everything necessary in one, no surprise price. From the Backstreet Boys to Coldplay, Ricky Gervais to Robin Williams, almost any act is available for shows in Japan. With all of these responsibilities handled flawlessly by BookingEntertainment.com, our clients in Japan can enjoy their favorite act with their guests. Booking Entertainment is excited to take its almost twenty years experience in the business and use it to make your Japan area event an unforgettable experience. We can act as a producer and handle the entire entertainment portion of your event, or you can have use just handle the contracting of the talent, in the role of an agent. Once you have an idea of how you want to proceed, simply submit your non-obligatory Entertainment Request Form below. If, even after searching our listed acts and packages, you are still uncertain as to what type of entertainment would be best for your event in Japan, we will be delighted to help you explore your options and select the perfect act.